The credit committee or loan committee review meeting is the final trial by fire for the loan proposal (credit memo) prepared by the loan officer and the credit analyst. 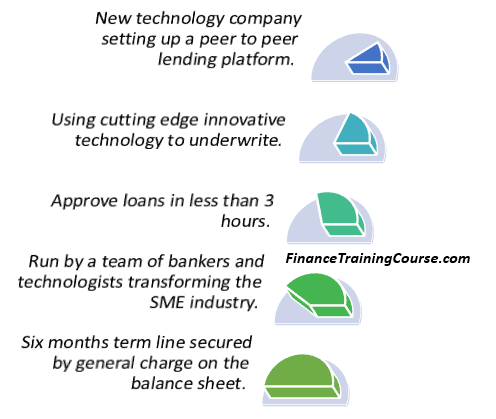 While credit risk as a function and a business reports to the Board Credit policy or Board Credit risk committee, a loan approval subcommittee does a final review of proposals that come before it for approval. Credit Committee / Loan Committee mandate. Interpret and implement bank loan policy and lending guidelines. Train the next generation of loan officers and credit analysts on the process of reviewing a credit proposal and on asking the right questions. Show where the focus of analysis should be on a case by case basis as well as set acceptable thresholds. Sets expectations about quality of analysis, insights and recommendations on a submitted credit proposal. The loan committee fulfills its mandate by sifting better proposals, proposals with a higher probability of repaying the borrowed amount, from the pile of applications in front of it. By using a process and framework driven approach that can be replicated outside of the committee by teams and individuals that the committee interacts and interfaces with. But most importantly by asking the right question for each case. While the same group may make credit policy recommendations, suggest improvements in the credit function and also review troubled loans and overall performance of the credit function for now our focus is on the role the loan approval committee plays in the approval of a credit application (aka credit memo, credit proposal or application for limit). a) Intent. The motivation and rationale for the transaction being financed. It must fit in with credit policy guidelines and documentation approved by the credit committee. Where there is a clash or conflict there is a very reasonable chance that the proposal in question will be declined, unless options and tweaks are found that can address the credit committee concerns. 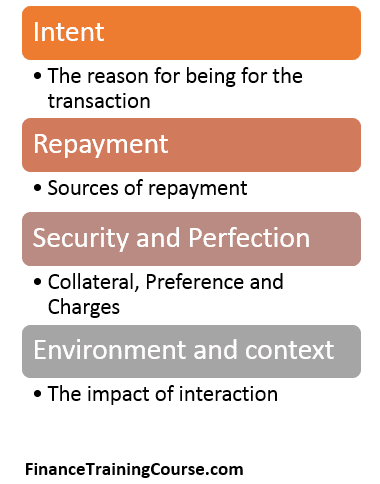 b) Repayment – Probability and track record of successful execution, repayment and delivery on the client side. Ideally multiple sources of repayments split between primary and secondary, organized by ability to collect and liquidate or by creating an incentive for the client to settle. Margins and haircuts to provide level of comfort in case of significant price or market moves. c) Security and Perfection – The strength of the collateral provided as security for the loan. The objective is to not to collect and sell. But to create an incentive for the borrower to repay. Also the priority of the bank’s charge and claim on the asset and if that charge is being shared with other borrowers. d) Environment. In times of stress will the business model behind the transaction hold. Will the environment and the context around the business support, help or make matters worse. This is primarily done by understanding how stable and robust the business model is. Simpler models operating in slow moving environments tend to react differently to system wide shocks compared to dynamic fast moving industry. Think brick and mortar stores versus online technology businesses. Which loan application would you prefer and support as part of a credit committee. When the loan officer or credit analyst reviews the documentation for the proposal, he or she must look at it from the point of view of the loan committee and then ask and answer questions they would ask before they ask those questions. Straight forward transactions are easy to sell. Complicated transactions need to be simplified or restructured before they can be sold to the credit committee. Here is an instance of a simple straight forward transaction. The client in question has a long relationship history with the bank with many profitable years and successful expansion projects behind them. Let’s take a look at the proposal summary again. What questions come immediately to your mind if you are sitting on the other side of the table during this meeting? That the economy will keep on growing for the next three years and that demand is stable. So by the time the project comes online 8 months later demand is still there. What proportion of the market does our client serve? What proportion is left unserved? How much more supply can the market comfortably bear? What is the basis for that assessment? How sure are we about timelines and cost estimates? What margin of safety exist in the model if delays occur and demand shifts? It is only when you are able to answer these questions to the satisfaction of the committee can you hope for approval for this project. So a monopoly or a pseudo monopoly within a slow changing market, a consistent physical tangible product that retains its value through the conversion cycle and does not age, depreciate or become obsolete over time is a good candidate. Stable and growing demand is even better. The right signals for approval would be if the entity in question has a stable history and relationship with the bank, if the pledged assets provide sufficient margin of safety and if there is a track record of successful execution of prior expansion projects. It is important for the team presenting the case to highlight these points right at the beginning so that the context for the conversation is set right from the start. A natural question is what would be a complex transaction look like? Complexity has many faces within a credit proposal and a credit committee meeting. A convoluted transaction with a purpose or intent that is not in direct alignment with core business. Side projects, experiments and variations not witnessed before in the market. But the most complex of transactions are transactions where there is risk of experimentation or exploration with the business model. Take the example below into consideration. Credit memo presentation. A complex transaction. 19 out of 20 credit committees will decline this proposal. And they should decline this proposal. Let’s look at the key trigger words. Innovative, Technology, Transformation. Excitement and promises for a better future doesn’t sell well in a credit committee meeting, boredom and consistency does. A credit committee is not in the business to rewrite the future; the sole purpose for its existence is to protect bank capital and deposits by reducing the risk of non repayment by a borrower. A simple straight forward transaction revisited. Let’s take a second look at our simple transaction above by changing one of the variables at a time. Keeping everything else equal, let us play with the product variable. Let’s start with the product. Let’s assume our client in question manufactures cement. What is the shelf life of manufactured cement? How sensitive is cement demand to economic conditions? How much do cement prices move on account of over supply? So if the expansion project comes online and the economy tanks or the competition rolls out their expanded production line at the same time we can either keep our new expanded capacity idle or store our manufactured cement in inventory for less than 6 – 8 weeks. From an operational and financial leverage point of view a cement plant sitting idle will be a white elephant posing next to a gypsum deposit. The context changes if you are the only cement manufacturer in a growing economy with a stream of large government sponsored infrastructure projects in the pipeline. It is completely different if you are one of the thirty plants competing for shrinking market share in a recession. The core focus of the loan committee would be on economic outlook, competition, total market absorption capacity and unmet demand and market share. In addition to the standard guidelines on preparing a credit proposal the team presenting the case must focus and address these questions. Compare this with a rice polishing, packaging and exporting firm. Basmati rice supposedly ages well so while a bumper crop may impact rice export prices, in a down market as long as the firm has adequate long term storage capacity, it can always age its inventory over time and ride the down cycle well. However compared to manufacturing cement the value addition by a rice polisher and the barriers to entry for the industry are significantly lower. The business is also likely to be a smaller family owned business run by immediate family compared to more professional and seasoned management team at the cement plant. Which would then lead to other questions dealing with diverging cash flows to personal and individual use, quality of accounting statements and questionable business practices. What about an automobile assembly plant in collaboration with Toyota? How would the credit committee react to a plant expansion proposal? What if the partner is not Toyota but a Chinese or South Korean brand? A memory chip manufacturer? A low end cell phones marketing and selling chain? A technology business focused on remapping the payment system nationwide? Each of these proposal would lead to a different conversation. As loan officers it is up to us to set the context for the conversation by identifying the right questions and presenting the answers the credit committee is looking for upfront. Previous Previous post: Six years. Next Next post: Copulas in Excel. Theoretical foundations.